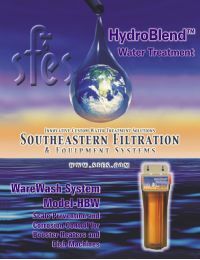 HydroBlend is a unique product manufactured to provide superior mineral scale prevention and corrosion control by feeding a special blend of scale control compounds into the water stream. The specially designed cartridge releases HydroBlend at a constant rate, resulting in a consistent scale and corrsion control for predictable periods of time. No electricity, maintenance, or guess work is required. A simple glance at the HydroBlend cartridge indicates when replacement is needed. Complete units include the flow-thru media delivery head, translucent high temperature sump housing, RSC-10-HW cartridge, stainless steel mounting bracket, and a filter wrench. Unlike regular phosphates, HydroBlend is unaffected by high temperature water, enabling it to provide effective treatment for Booster Heaters and Commercial Dish Washing Machines. Obtaining Proper Rinse Temperatures Meeting Health Department Requirements. For high temperature water applications up to 160º F.